UNIVERSO, is set to premiere season three of the hit celeb-reality “The Riveras” starring Chiquis, Jacqie and Mike, Jenicka and Johnny, March 11 at 10 p.m. /9C. The 14-episode season offers viewers a lens into the lives of the children of the late Regional Mexican music legend, Jenni Rivera as they take on life’s challenges by supporting each other. The top rated show is the only English-language reality about a Hispanic family in the U.S. and its relatability has been the key to the show’s success. “The Riveras” reflects the diversity in this country, and the fastest growing population. To get a first look of the new season, open this YouTube link youtu.be/bLBoX1nyadk. Jacqie decides to separate from her husband of five years and struggles to balance her new life as a single mother. Her 70 pound weight loss brings Jacqie confidence and courage as she follows her passion for music. Mike continues single parenting his autistic daughter Luna and steps out of his comfort zone and tries stand-up comedy. Jenicka breaks the news to Mike that she will be moving back with Chiquis, and embraces her curves to pursue a plus-size modeling career. Johnny, the youngest of the siblings graduates from high school and opens up publically about his sexuality. “The Riveras” is Executive Produced by Irune Ariztoy for UNIVERSO and Edward Paige and Liane Su for Blank Paige Productions. 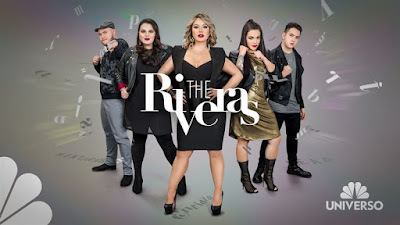 Fans can engage on social media by using the hashtag #TheRiveras and find more content about the show on Facebook facebook.com/TheriverasTV and Instagram instagram.com/theriverastv/. Viewers can catch up with “The Riveras” by binge watching on Video on Demand, www.nbcuniverso.com/NOW, and the UNIVERSO NOW app. To find UNIVERSO on your satellite, telco or cable TV channel lineup, go to Channel 410 on DIRECTV; Channel 838 on DISH Network; Channel 3009 or 3010 on AT&T U-verse; and visit encuentranbcuniverso.com for the UNIVERSO channel number on your local cable TV listings. UNIVERSO is currently available to 40 million households across the U.S. The network is telecast in HD nationwide on DirecTV; Western U.S. markets served by Comcast Xfinity TV; throughout Bright House Networks’ cable television footprint; and select Cox Communications markets.